Hello again. Been gone awhile – but it went by so very fast. Closed another month of books at work and tried to be ‘in the moment’ with the kids the past two weeks. Had to get some ‘me’ time in though still. 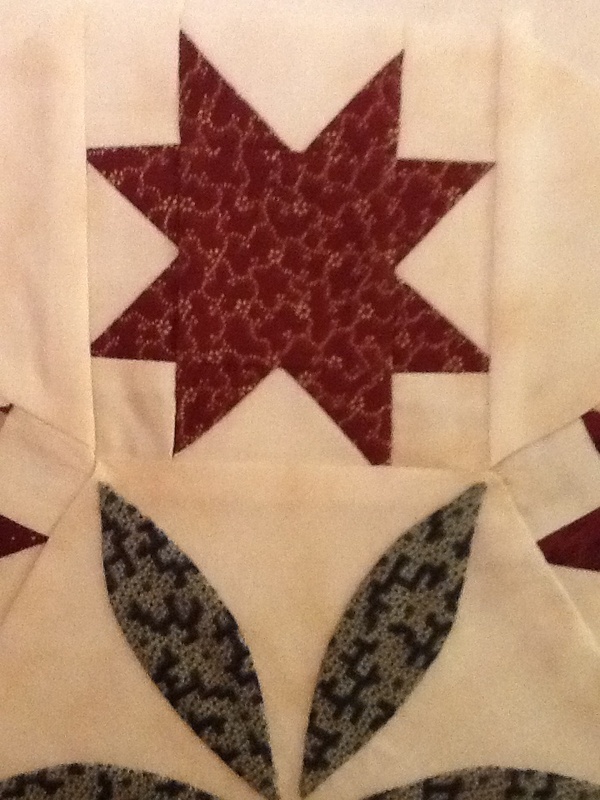 I have a weekend finish to my Avalon quilt top, although I may still embelish a bit when I go to quilt it. Waiting on the Avalon yardage to come in (and another paycheck) to get the backing. I decided to make excellent use of my California Girl fabric that I bought on extreme sale from my local quilt shop that sold out its bolts last year. I bought several yards of each of the stripe fabric in three different colorways. 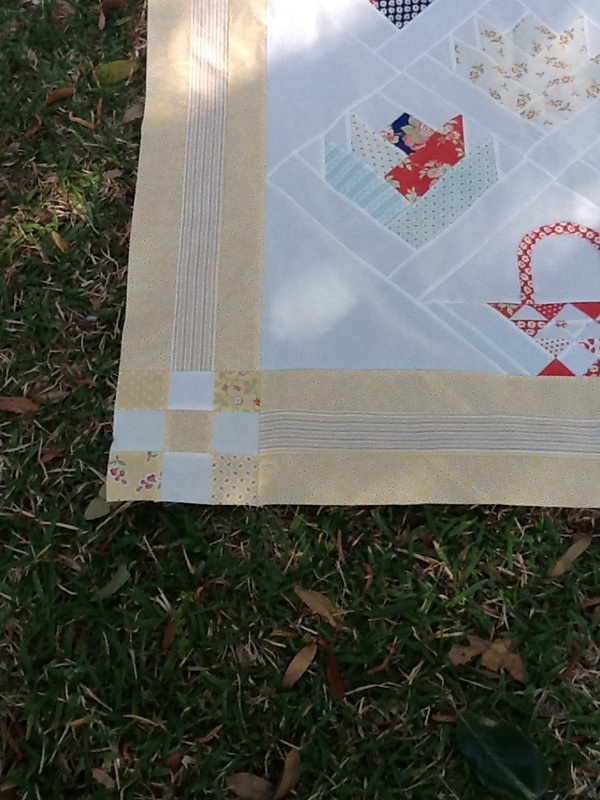 I picked the gray and yellow stripe to complete the border and 9-patch corners. Very sunny and cheerful! Turns out that it could now fit a California Twin (if they existed). 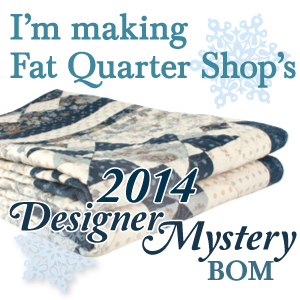 Borders are my nemesis… and finding any place that I could possibly lay out a quilt to baste it. I may have to wash down my driveway one day, pitch a tent to keep bird poop off and tape it to the concrete. I just don’t have that much floor space! Or… I guess I can bring it to my office and baste it after work one day by T-pinning it to the commercial carpet. It all feels like dirty options. Or tape it up on the livingroom wall? I saw a tutorial one time where someone took newspaper to mask off the surrounding area and spray basted their quilts in the garage on the wall. Maybe I could try that in the livingroom. Another psuedo finish for this weekend was my Robin’s Nest BOM. 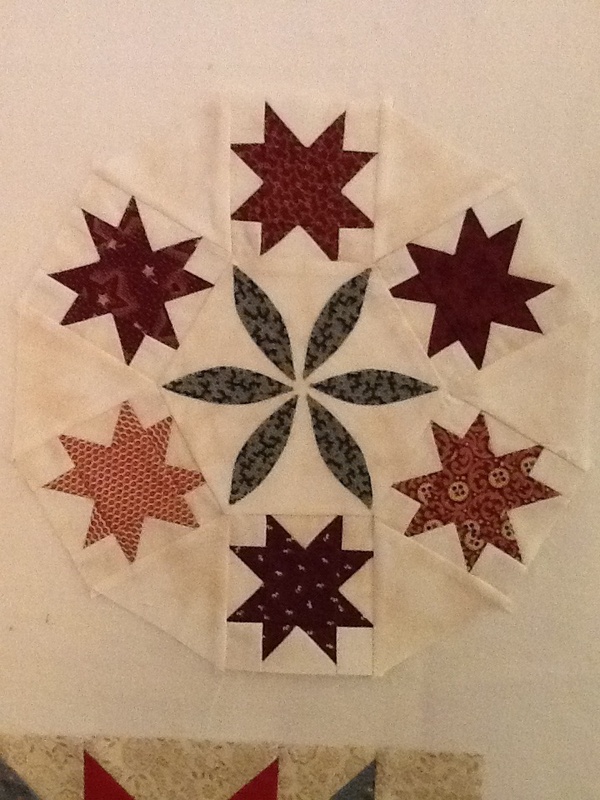 I did finish the center ring of red stars and stitched it to my appliqued hexagon. Those star blocks finish at 3 inches! 3 INCHES! This was going to be a challenge for sure. I have my mini fit-to-be-geese ruler on order with Monique, but she is waiting for a shipment to come in… I do have perfect acrylic templates that allow you to cut the shapes exactly as they should be, with squared off corners and all to make it fit. Surprisingly, I got better results on this project when I made sure I didn’t skimp on the 1/4″ seam allowance. Those seams seemed so BIG compared to the finished size of these pieces. Look at those pitiful points and pinched connecting triangles! Calm down, not the end of the world. Except that I have someone special in mind for this quilt and I want it to be as perfect and beautiful and I know it could be. Thankfully, Homestead Hearth provided enough fabric such that I could screw this up at least twice and still make another set that is worth a damn. 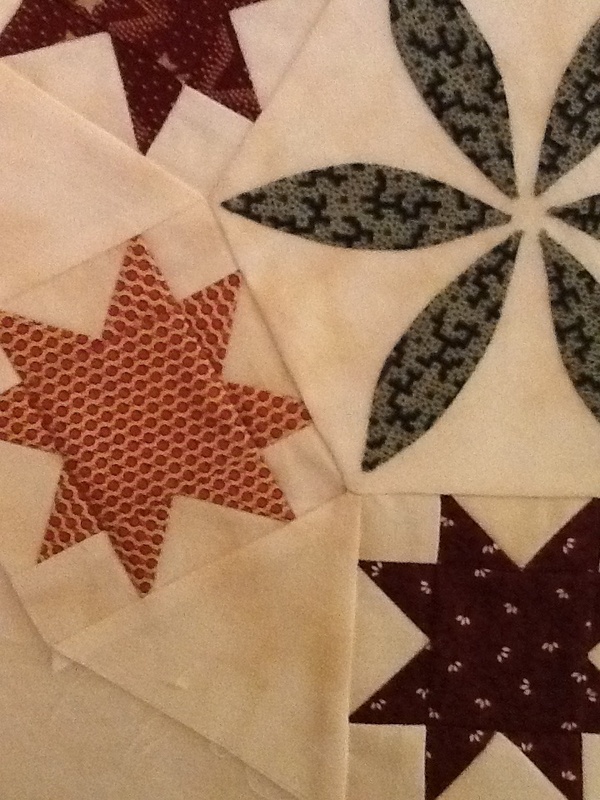 So… I ripped out all the stitches and salvaged the center hexagon. The red stars were too distorted to fool with. Here is “Take 2” on those stars. They look better already. Practice is making better (not perfect yet). So, 2 stars redone and 4 more to go. The next ring is 12 blue stars, done the same way. Hopefully I will be a pro by then. Therefore, I am still linking up to Sinta’s BOM Rehab since I technically did complete my block – at least once. 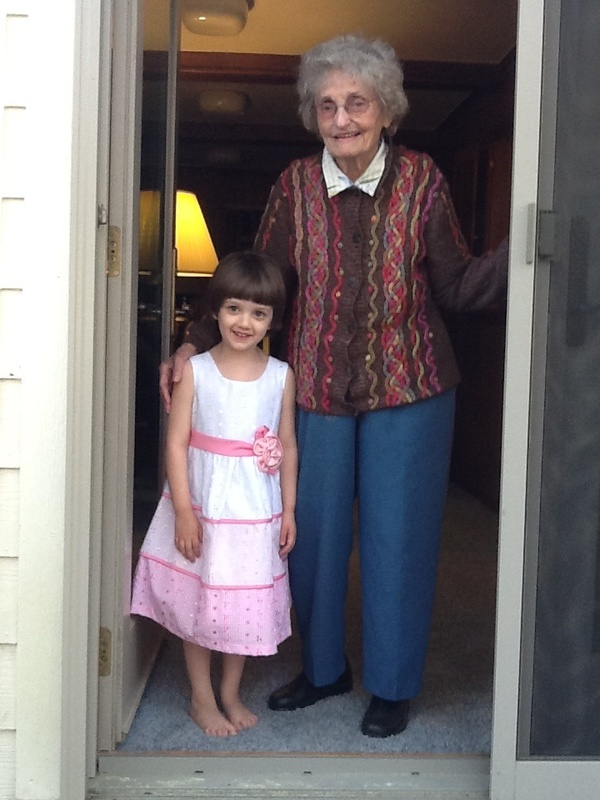 Finally – a gratuitous picture of my grandmother and daughter. I took this last weekend when I was visiting my parents to celebrate my brother’s and my birthday week. ← Starting new BOM! Border of the Month from Australia! Avalon is gorgeous! 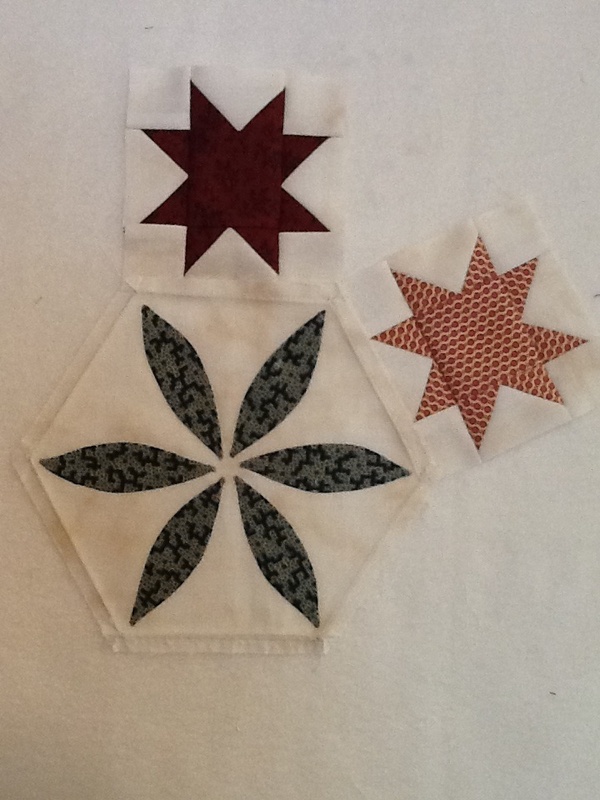 Keep going with your BOM – are you hand or machine piecing? 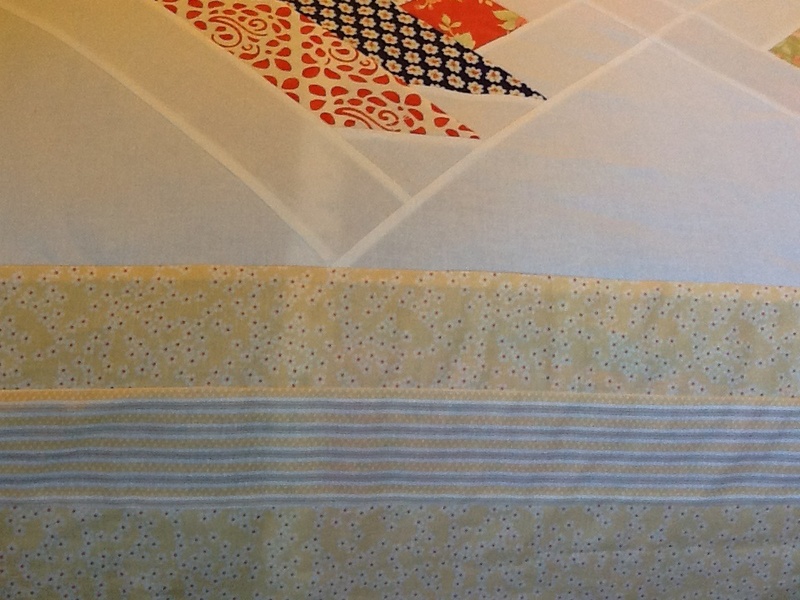 Either way, make sure you mark those corner holes onto your fabric and pin match before stitching. The acrylic templates are fabulous to use. Love the family photo! Thanks for the support! The blocks are coming out better this time. I’m just wondering now how the best way to connect the star ring to the center hexagon. Should I do it like English paper piecing or just hand stitch it? The first time I tried was on the machine, but I don’t think it works out the best. Would love your advice! 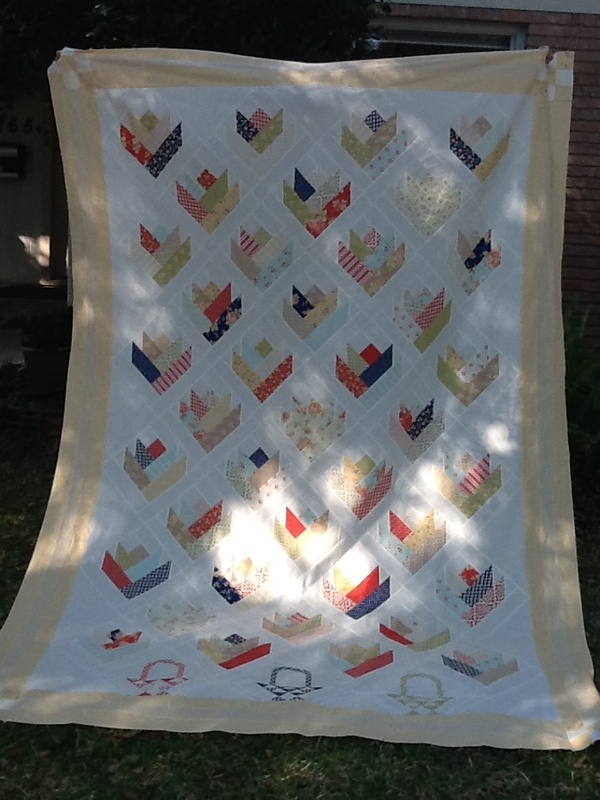 Your quilt is so sweet… and I love your little baskets on the bottom, that is perfect! You are amazing to take on that block… it looks like a challenge to me (more than I could handle) Good luck with it, I know you can conquer it! AND happy birthday to you!!! I hope your day and year are extra special! 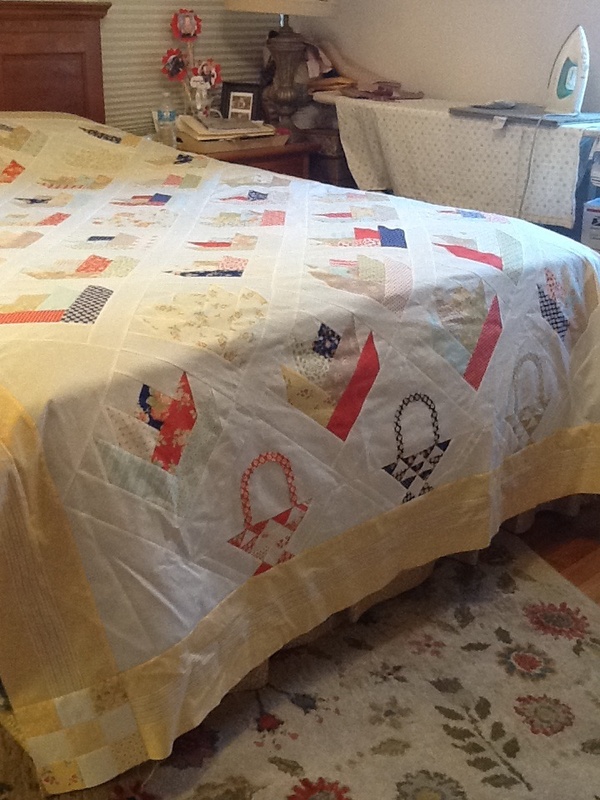 I love the border on your quilt! I’m going to use that as inspiration for my next one. Your daughter and her dress are so cute. The photo of your Granny makes me miss my Mom.